As if everyone in the Fenton, Michigan area was not already over the inclement weather we have seen recently, it appears another storm system is predicted to come through the Michigan region Monday night. 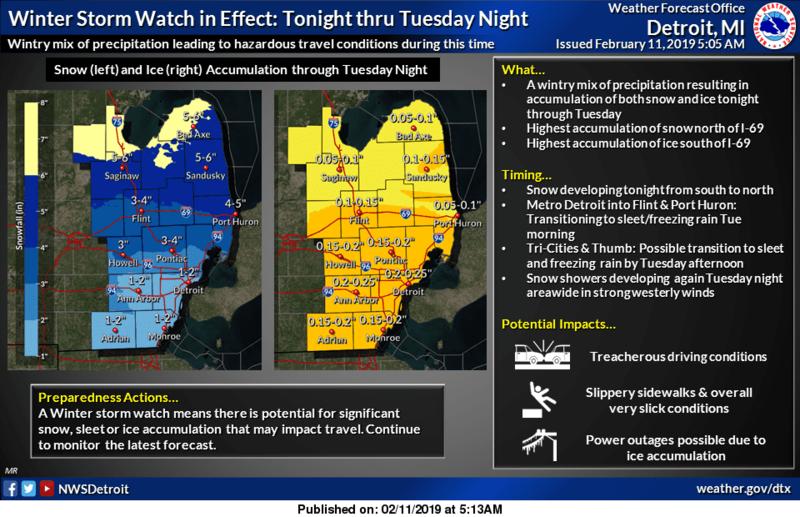 The National Weather Service is showing the system covering the entire Michigan region as you can see in the forecast map below. The question everyone will be asking is which areas will see snow and which will see ice. Currently the Fenton area is right on the border and until we get closer it will most likely be uncertain. UPDATE: As of 2-11-19 at 8:42a.m. The National Weather Service update shows .1-.2″ of ice and 2 to 4 inches of snow Monday night thru Tuesday night in the Fenton area. According the Weather.Gov the forecast for Fenton, MI 48430 is as follows as of 2-11-19 at 8:42a.m. Freezing rain and sleet, possibly mixed with snow after 1am, becoming all freezing rain after 4am. Low around 25. Breezy, with an east wind 13 to 18 mph, with gusts as high as 24 mph. Chance of precipitation is 100%. New ice accumulation of less than a 0.1 of an inch possible. New snow and sleet accumulation of around an inch possible. Freezing rain before 10am, then freezing rain likely, possibly mixed with snow between 10am and 1pm, then rain after 1pm. High near 38. Breezy, with an east wind 8 to 18 mph, with gusts as high as 26 mph. Chance of precipitation is 100%. New ice accumulation of less than a 0.1 of an inch possible. New snow accumulation of less than one inch possible. Rain and snow before 10pm, then snow, possibly mixed with freezing rain between 10pm and midnight, then snow after midnight. Areas of blowing snow after 10pm. Low around 23. Breezy, with a west wind 11 to 16 mph increasing to 17 to 22 mph after midnight. Winds could gust as high as 37 mph. Chance of precipitation is 80%. Little or no ice accumulation expected. New snow accumulation of around an inch possible. Keep an eye out for another system that is forecast to come through on Friday that could potentially leave 6-10 inches behind. You can stay tuned to The Lasco Press for more updates as we track this weather event today and tomorrow.